With respect to the relics of the Crucifixion – the so-called arma Christi (‘weapons of Christ, or Instruments of the Passion) – Lombardy has long since cornered the market on the Holy Nails. Milan’s Holy Nail (Santo Chiodo) is securely fixed to the top of the Duomo’s apse where it is identified by a red light. It’s free to view, but binoculars are recommended (see future post on Milan’s Santo Morso ‘Holy Bridle’ and the Rite of the Nivola)! Some fifteen kilometers away, Monza’s Holy Nail comprises the inner band of the Corona Ferrea (‘Iron Crown’), Italy’s famed royal crown and national symbol (see future post on the Corona Ferrea). The Corona Ferrea is kept in the Chapel of Theodelinda of the Monza Duomo and costs four Euros for a fifteen minute viewing. While there’s no such thing as ‘finders keepers’ with Christian relics – relics were frequently stolen and plundered, such as Milan’s relics of the Magi – there has been a Milanese connection to the Holy Nails for over 1600 years. In 395 CE, Saint Ambrose of Milan made a historic digression in his funeral oration for Emperor Theodosius (347 – 395 CE) in which he provides our earliest extant source for the relics of the Holy Nails, purportedly discovered by Saint Helena during her Holy Land excursion in 326 – 328 CE. ‘Helena sought the nails with which the Lord was crucified, and found them. From one nail she ordered a bridle to be made [the tradition linked to Milan], from the other she wove a diadem [the tradition linked with Monza]. She turned the one to an ornamental, the other to a devotional, use. 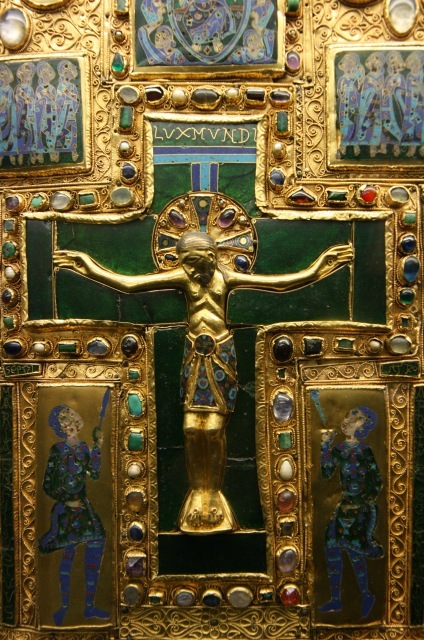 So she sent to her son Constantine a diadem adorned with jewels which were interwoven with the iron of the Cross. She sent the bridle, also. Constantine used both, and transmitted his faith to later kings. ‘Wisely did Helena act who placed the cross on the head of sovereigns, that the Cross of Christ might be adored among kings. Good, therefore, is the nail of the Roman Empire. It rules the whole world and adorns the brow of princes, that they may be preachers who were accustomed to be persecutors. Rightly is the nail on the head, so that where the intelligence is, there may be protection, also. ‘On the head, a crown; in the hands, reins. A crown made from the Cross, that faith might shine forth; reins likewise from the Cross, that authority might govern, and that there might be just rule, not unjust legislation. May the princes also consider that this has been granted to them by Christ’s generosity, that in imitation of the Lord it may be said of the Roman emperor: Thou hast set on his head a crown of precious stones. ‘But I ask: Why was the holy relic upon the bridle if not to curb the insolence of emperors, to check the wantonness of tyrants, who as horses neigh after lust that they may be allowed to commit adultery unpunished? Ambrose does not directly say that the nails had found their way to Milan, but there is reason to believe that they had, especially given Milan’s status as an imperial capital. In any case, the legend of the two Holy Nails – the bridle and the crown – became respectively entrenched in Milan and Monza. ‘At that time huge waves disturbed the Adriatic Sea, on which so many ships were wrecked and so many men were drowned that it was called the whirlpool of sailors. The far-sighted empress, concerned over the disasters of these miserable men, ordered one of the four nails to be thrown into the sea. She relied upon the pity of the Lord that he was able easily to calm the salvage rolling of the waves. Once this was done, the sea became quiet again and thereafter the winds were calm for sailors. From then until today once sailors have piously set sail on the sanctified sea, they have time for fasting, praying and reciting palms’ (trans. by Richard Van Dam).